It seems clear that Dr. Ben Carson was a loser at Tuesday's GOP debate. Carson, neuroscientist and subject of the film Gifted Hands, failed to shine, taking a nearly silent loss at the Milwaukee Theatre in Wisconsin. The podium was stacked with the eight highest-polling candidates, with Carson standing one off from the center as the current runner-up behind Donald Trump. Each participant was fighting to be viewed as a top contender and take points away from the frontrunners, and Carson seems to have surrendered early in the night. 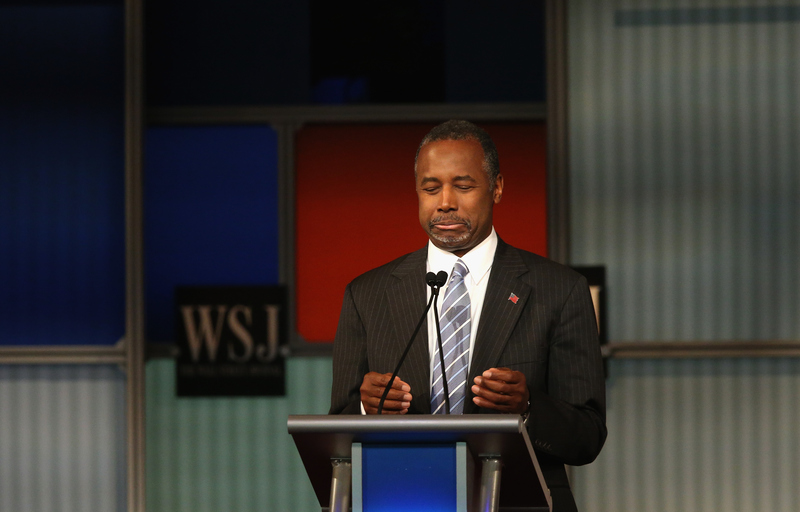 Despite his current polling numbers, Carson was far from exceptional at the debate. The "Your Money, Your Vote" focus of the third debate meant that candidates could prepare more exact answers regarding the economy. This matchup had a more general focus on jobs, taxes, "the general health of the economy," and international issues. And while it's certainly good news that the Republican candidates covered a broader array of issues, Carson simply didn't come prepared to tackle them. Carson also didn't get to talk much. Donald Trump and Carly Fiorina have dominated the talking time clock in the last three debates, which typically (although not always) equates to a win. Carson got overpowered by the gabbiest candidates, and didn't get a chance to talk much about his issues. It's been a consistent problem for Carson over the last two debates — he was third from the bottom of the clock in the last debate. Although it must be said that this doesn't seem to have hurt his standing in the polls. It's understandable that Carson didn't want to speak too much, thus opening himself up to shots from competitors about his recently uncovered lies about receiving a full scholarship to West Point. But his reluctance to speak up and insert himself into the debate meant that he appeared weak and uninformed in front of a packed theater and a television audience of millions. Carson lost in the court of public opinion, too. The Twitter-verse is roasting him for his weak showing. If the Twitter reactions are any indication of public polling, his numbers are going to take a nosedive this week. Carson's debate performances have been less than stellar, and there's a real possibility he will take a tumble in the polls due to Tuesday night's uninspired showing. His lack of policy knowledge and lack of charisma both seemed on full display in the crowd of candidates fighting to capture the audience's attention.